He admitted that cumbersome laws and taxation must go to help developers but ultimately this should lead to affordable housing. In this context, the new development control rules (DCR) for Mumbai will ensure that the discretionary powers of officials are reduced to the minimum and the entire process becomes transparent. Referring to the just trashed DP (development plan) for Mumbai, Mr Fadnavis said it had large scale and blatant errors and provisions that would help only few individuals. He asked the BMC to rectify the mistakes and publish the DP again. About the Pune DP, which has been pending for eight years, he said a three-member committee has been appointed to expedite the process of finalizing it. NAREDCO President Sunil Mantri said the government’s target of housing for all by 2022 is a gigantic task. “We from developer’s side would like to commit ourselves to do whatever possible to ensure that the target is met,” Mr Mantri said and called for making the housing policy conducive to development and not an obstacle. Stressing for housing reforms, Mr Mantri called for single-window system of clearances and easy finance for developers and home buyers. Housing sector is highly labour intensive; he said and pointed out that it is capable of generating thousands of jobs and ensuring wellbeing of several families. 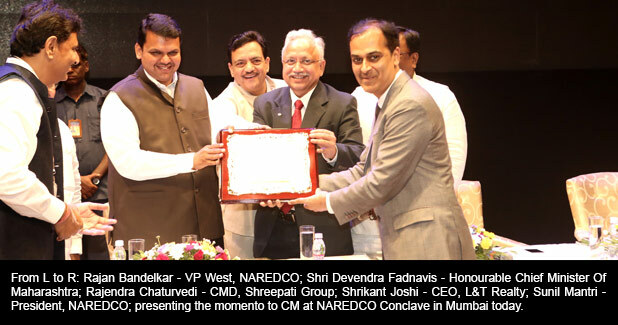 He called upon the developer community to join the government in building new Maharashtra. The government will effectively use technology to check corruption by minimizing the human interface for clearance of plans. The day-long conclave, in which several Maharashtra Ministers and government officials participated, was aimed at finding solutions to the vexed issues of affordable housing. KPMG in India was the knowledge partner. The conclave addressed various issues in order to overcome the housing deficit in the State and strategies and action plan to augment supply of housing stock especially targeting the Economically Weaker Section (EWS) and Low Income Group (LIG) segments where the shortage is as high as 96%. Creating a sustainable frame work and mechanism to take care of mis-match between demand and supply in future was also discussed at the conclave. KPMG recommends that the state government should focus on a four-pronged strategy: development of new economic centres, strong transport infrastructure, conducive business environment and rejuvenating the existing cities. KPMG in India is the Indian member firm of KPMG International and was established in September 1993. It strives to provide rapid, performance-based, industry-focused and technology-enabled services, which reflect a shared knowledge of global and local industries and its experience of the Indian business environment. KPMG in India provides services to over 2,700 international and national clients in India and has offices in Ahmadabad, Bangalore, Chandigarh, Chennai, Delhi, Hyderabad, Kochi, Kolkata, Mumbai and Pune.